Another heavyweight offering from the Oxford Handbook series which covers technology in the ancient Greek and Roman civilizations. As with other books in the series, each chapter is written by a specialist in their field giving a comprehensive and detailed overview of the subject. The book begins with interesting chapters which define technology, the ancient's view of it and the changing academic perception of the use and evolution of technology in this period. The book covers areas such as mining, metallurgy, energy sources and agriculture. Engineering and construction are amply treated with chapters on the construction techniques of buildings, aqueducts, tunnels, bridges and war machines. Also covered in individual chapters are industries such as textiles, ceramics, glass, woodwork, leather goods and food preparation. Finally, sea and land transport, scientific instruments, coinage and time-keeping are also examined. The book is perhaps aimed at specialists as it gives an up to date review of research on the various themes and it can at times read like a private correspondence between academics. However, there are many chapters easily accessible to the general reader and the book offers an insight into areas not easily found in other works. With a bibliography for each chapter, extensive index and a smattering of black and white photos and illustrations. Cartwright, Mark. 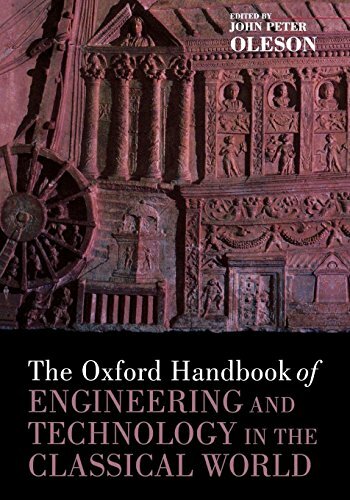 "The Oxford Handbook of Engineering & Technology in the Classical World." Ancient History Encyclopedia. Last modified August 27, 2012. https://www.ancient.eu/review/22/. Cartwright, Mark. "The Oxford Handbook of Engineering & Technology in the Classical World." Ancient History Encyclopedia. Ancient History Encyclopedia, 27 Aug 2012. Web. 20 Apr 2019.